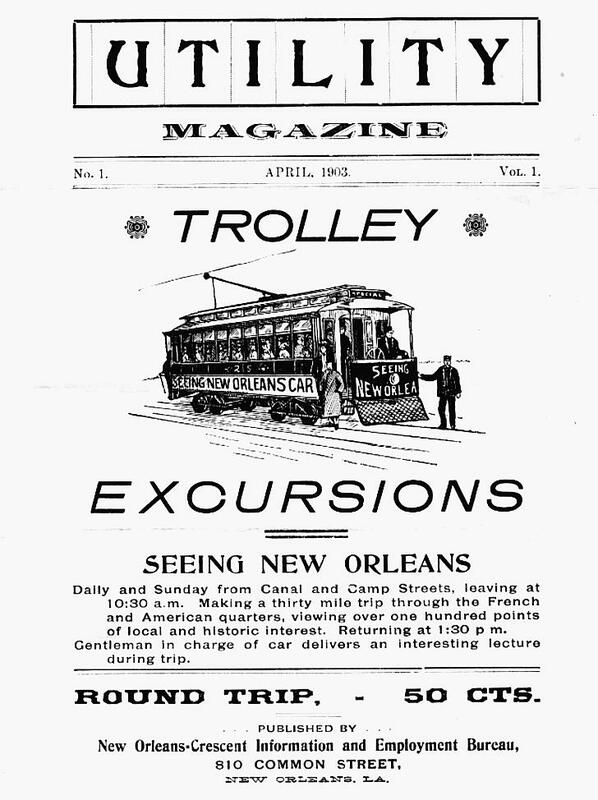 A ride around New Orleans could be had for 50 cents in 1903 on the "Seeing New Orleans" Trolly Excursions..."Making a thirty mile trip throught the French and American quarters, viewing over one hundred points of loal and historic interest. Gentleman in charge of car delivers an interesting lecture during the trip". The tours lasted from 10:30 A.M. until 1:30 P.M., begining at Canal and Camp streets. The car headed for Esplanade Avenue to City Park then along City Park Svenue to the cemeteries wher it turned toward West End. From there, it returned to Canal Street, making its way to Audubon Park before heading back to its origin.